A thunderstorm just rolled through my neighborhood, followed by a heavy dose of rain, a good day to catch up on things inside my house. I wanted to share with you the last bit of the shower pictures, the invitation. I saw this idea on a wedding site and wanted to try it out for myself. My friend, Sally, printed out the invitation on to transfer paper (she had the required ink jet printer) and then I ironed them on to handkerchiefs. They were fun to put into pretty envelopes and mail to all the ladies. I think this would make a fun baby announcement as well. Diane found the hankies for me in Shipshewana and they were very inexpensive. I have been eyeing this purse, made by Kathy of Kathy's Cottage, for quite some time. I decided to treat myself last week and ordered it. I'm so glad I did! First of all the sewing is impeccable. I love the vintage tablecloth mixed with cheerful red gingham. 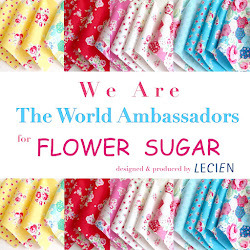 The flower brooch on the pocket is so pretty! One of the best features, which you can't see from the picture, is the pockets inside that were made from feedback material from Kathy's Grandmother's stash. It arrived with a cute box of buttons and adorable tags. I have gotten so many compliments on it already and I feel like I'm carrying "summer time" on my arm wherever I go. Thank you, Kathy! Another treat came in the mail a few days ago as well. I won a giveaway at Notes of Sincerity. Trish made this beautiful bracelet. I love the bunny charms and the way it sparkles when I wear it. It fits my wrist perfectly. I love that the purse and the bracelet came from two of my blogging friends, it makes them that much more special. Both of these talented women have beautiful blogs, be sure to stop over and visit! I absolutely love those invites. So clever, and they turned out so well. And, how cute is that tote with the vintage tablecloth fabric? I think we're having the same storms you are! The hankies were a fabulous idea! I bet it was so fun to receive! I love the invitations! I'm so stealin' that idea.LOL! You did such a fabulous job on absolutely everything! 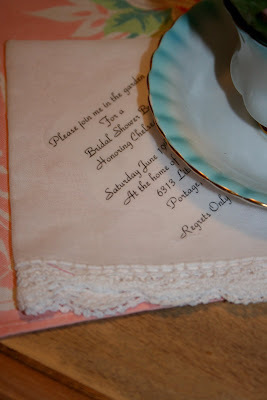 They are both beautiful gifts and I love the hankie invitation idea!! It is great how Cathy used the vintage tablecloths in her purse! So neat and cute cute cute!! I adore everything in Kathy's etsy shop! And this little purse is just adorable. Have you seen her pillows? Oh talk about swooning over her house pillows. Way too cute! :o) I have a heart pillow that hangs on my armoire in my little sewing area and it is so pretty and cheerful! What a special keepsake to have, the invitations on the handkerchiefs. What cute things! Your blog is always a breath of fresh air. Your shower ideas are just so over the top. Everything is wonderful. And your bag is so great. I'm heading over to check out her blog! What a clever idea for invitations. Well, your new bag is about the cutest thing I have ever seen. I love the use of a vintage tablecloth. Why didn't I think of that...I have a drawer full. I need to visit those blogs. What gorgeous tote, Renee! Love the fabric and colors.